Trump threatened those who don’t “wind down activities with Iran” that they are risking “severe consequences.” It remains unclear how that will play out. The statute prohibits EU persons from complying with the US sanctions without an exception, and also provides for recovery of damages caused by the sanctions, among other actions. 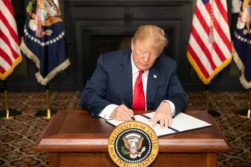 While Europe is striving to scuttle the renewed American sanctions, Trump declared that the US is succeeding in convincing others to cut Iranian business.